Sandakphu, being the highest peak in West Bengal, offers grand views of the world’s tallest peaks. Lhotse and Makalu, the fourth and fifth highest peaks in the world stand tall at 8,516m and 8,463m, trying to outdo the world’s tallest peak. But how can they? After all, the Everest stands between them, towering over everything! Sandakphu throws open an incredible panorama of world’s highest snowline, swerving from the snow ensconced peaks of Nepal to Bhutan and farther east to Tibet. 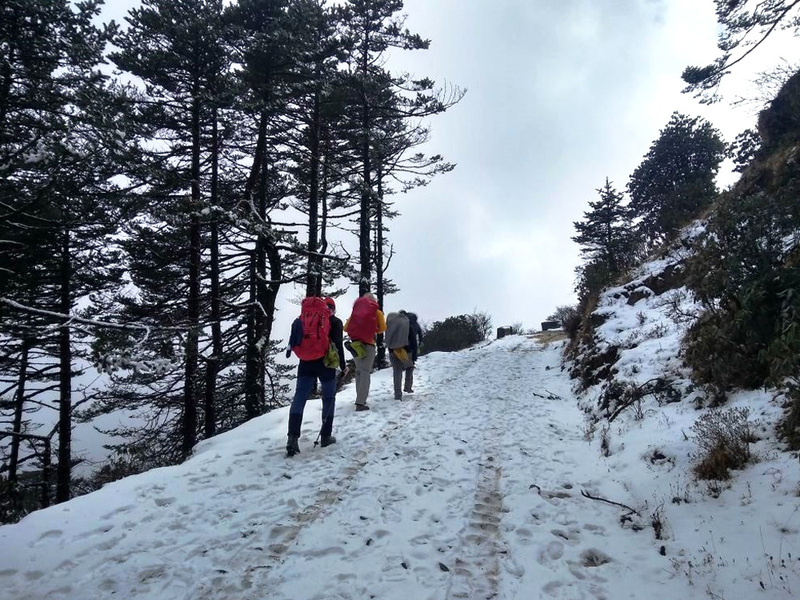 The trek route zigzags along the Singalila Ridge and moves this side and that of the Indo-Nepal border, switch backing and switch-bordering towards a enchanting visually charged summit that makes it all worth it. 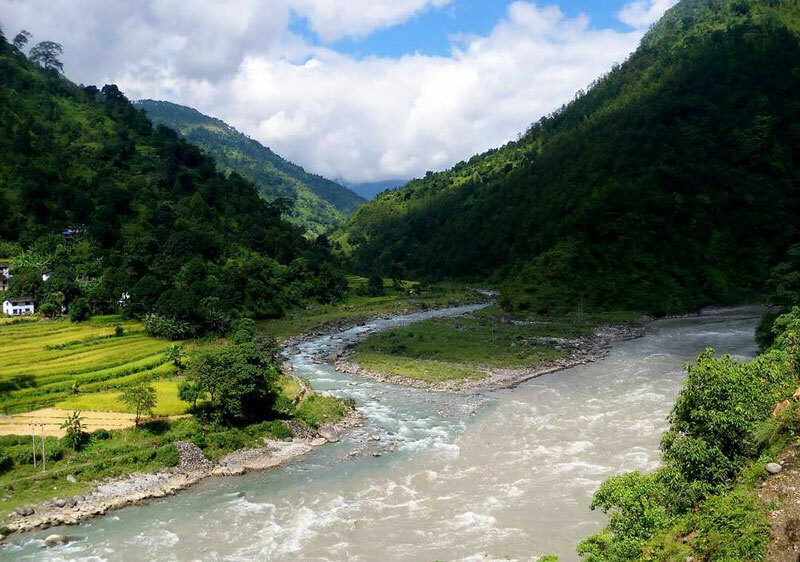 The charming wilderness and wildlife expected of a Himalayan Trek is met as we pass through Singalila National Park, making the hike also one of keen naturalist interests. 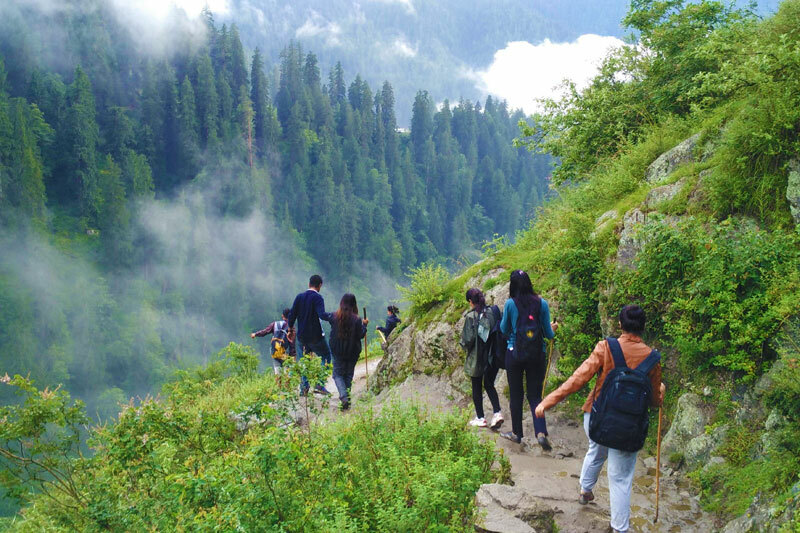 There are innumerable intriguing bird life, animals, and flora that you would be fascinated to explore in the diversity along this trek route’s sub-alpine and temperate coniferous, broadleaf, and subtropical coniferous forest biomes. 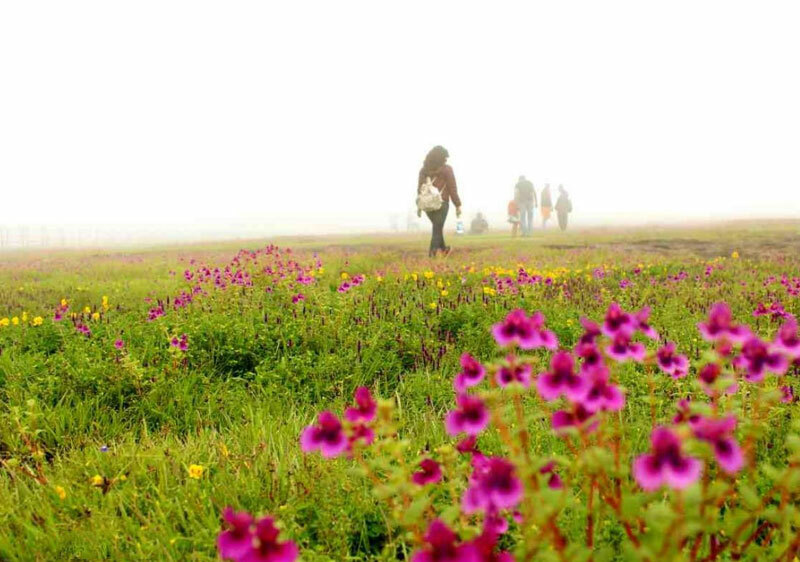 Sandakphu is the ONLY place which offers you the view of four of the five highest peaks of Mt. Everest. If this does not excite you enough, just imagine trekking through the beautiful peaks and stumbling across beautiful orchids in your way. This trekker’s paradise is located in the North west of Darjeeling town hill at an altitude of 12,000 feet. Please note: To trek the Sandakphu and Singalila ranges, you will need a permit and ensure that you have a registered guide. By Train: New Jalpaiguri or NJP is a major railway station located in south west of sikkim. There are many long distance trains arrives or pass through the NJP station. You can choose to come to Kolkata and take one of the many trains to NJP. If you are coming from Delhi or north part of India, try to take any north east train which directly goes to NJP by passing Kolkata. By Flight: Flying to Bagdogra is another option that you can choose though flights to Bagdogra tend to be pricier than those to Kolkata. Most of the flight foremost metros in the country come here. A backpacker’s happy place and a writers dreamland, Kausani is one such village of Uttarakhand which is also enjoying its stature as a quaint hill station. Cradled under the sheath of the crimson sun and the dark green hills, Kausani is known for offering a panoramic view of the massive Himalayan peaks such as Trishul, Nanda Devi, and the mighty Panchachuli peaks. Stay in Kausani: Kausani is a popular tourist destination and thus attracts large number of tourists and backpackers to this place. As a result there are adequate accommodation options for tourists to stay at Kausani. One can find luxurious hotels and resorts as well as budget guesthouses with limited amenities. The facilities may vary from hotel to hotel. Some resorts also offer tent accommodation. Food in Kausani: Few local restaurants and roadside dhabas have mushroomed at Kausani however, finding a proper restaurant with variety of cuisines is little difficult. At best, in-house restaurants at your hotel and resorts may provide you with some culinary delights. The local restaurants offer mainly north Indian dishes along with popular Chinese items like noodles, Manchurian etc. • Kausani is famous among tourist as Hill Station and Peaceful Surroundings. 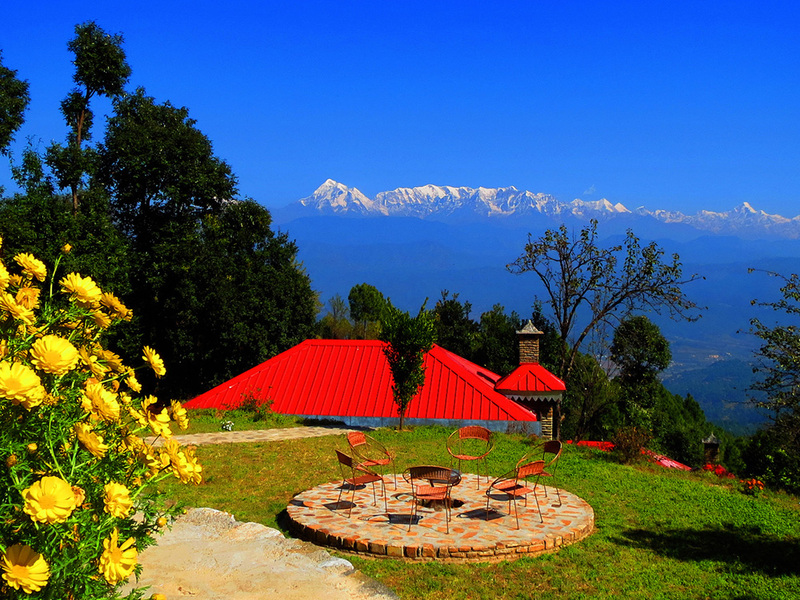 • Kausani is recommended destination for Couples, Family and Kids, Foreigners, Solo. • Kausani is popular destination for following activities/ interests - Christmas and New Year, Hill Station, Honeymoon Destination, Leisure, Weekend Getaway. How to Reach: Kausani is well connected with most of the important towns and cities of Uttarakhand. Getting there guide below provides detailed information about how to reach Kausani by Road, Train or Flight. Another jewel hidden in Uttarakhand is Kanatal. Apple orchards, quaint roads, friendly locals. All in one. Since Kanatal is untouched by urban civilisation, it is the most PERFECT location to unwind, relax and get lost in the beauty around. The tiny hamlet of Kanatal is perched at an elevation of 8,500 feet above sea level on Mussoorie - Chamba road. Kanatal is a perfect winter destination as it snows here and is also an ideal place for camping. One of the popular tourist attractions, the Surkanda Devi temple is located only 10 km away from Kanatal. The pleasing environs, the salubrious weather and the quietude of Kanatal are enough to lure any traveler to visit this place. 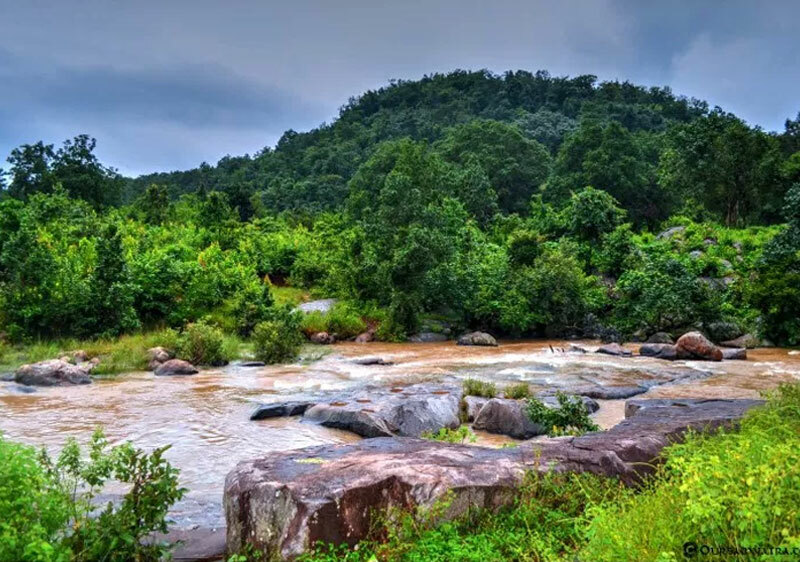 Although, the place is relatively unexplored and secluded but travelling here is swift and easy as the hill station is well connected with motorable roads. You can stroll around the village, visit the apple orchards, breathe in the scent of the rhododendrons, pick the wildflowers, enjoy photography and bond with nature itself. You can also have a little chit-chat with the locals to know how life is in the hills or pay obeisance at the small village temples. Meditate and get rid of all the unguarded thoughts in the pleasant ambiance of Kanatal. The adventure lovers can go on a quest into the wild and walk through the dense Kodia Jungle located only 1 km from Kanatal. You can savour the refreshing views of the bubbling natural springs and if lucky, you can spot a few wild animals. Also, Tehri Dam which is a yet another touristy place in the proximity of Kanatal should be visited at any cost. For excursions, one can visit Chamba, Mussoorie, and Dhanaulti that can be easily accessed from Kanatal. Hiking: Kanatal offers ample opportunities for trekking and hiking in the lush green forests in the vicinity. In the summer season, trekking can be paired with camping which makes for an ideal outdoor activity. Ayurveda Spa: Some resorts in Kanatal offer full body Ayurvedic treatments for their guests where traditional herbs and medicines are used to cure mental and physical ailments as well as stress. Nature Walks: The abundant flora that encapsulates Kanatal is perfect place for nature lovers who always seek the company of nature. Nature Walks are ideal activity to explore and enjoy Kanatal’s phenomenal beauty. 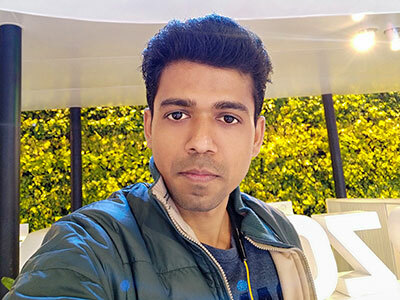 Stay in Kanatal: Kanatal is a hidden jewel that has only recently caught the eyes of tourists who want peace and tranquility in the lap of Mother Nature. Being a hidden destination, there are only a handful of accommodation options available at Kanatal. There are quite a few luxury and semi-deluxe resorts and hotels at Kanatal with all the amenities and facilities. Tent accommodations are also available at Kanatal. We recommend Pahadi House in Kanatal as it offers local cultural expereince and cuisines for guests. Food in Kanatal: Kanatal is a remote hill station and it is still untouched by urbanisation, so one does not find any fast food joints and restaurants here. The only restaurants you find here are the ones in the resort and hotels. These restaurants in hotels serve mostly multi-cuisine chinese, continental or north Indian food. How to Reach: Kanatal is well connected with most of the important towns and cities of Uttarakhand. Getting there guide below provides detailed information about how to reach Kanatal by Road, Train or Flight. By Air : Jolly Grant Airport is the nearest Airport to Kanatal situated 92kms from Kanatal with well metalled roads and can be easily covered within 3 hours of time.. Taxis are easily available from Jolly Grant Airport to Kanatal. Jolly Grant Airport is well connected to Delhi with daily flights. By Train: The two nearest railway station connected with Kanatal are Dehradun and Rishikesh. Dehradun is situated 85kms from Kanatal and the distance from Rishikesh to Kanatal is 75kms. Taxis and buses are available from both these destinations to Kanatal. Kanatal is well connected by motorable roads with both these destinations. Dehradun and Rishikesh are well connected by railway networks with major destinations of India. By Road: Kanatal is well connected with motorable roads situated on Mussoorie-Chamba road. Luxury and normal Buses to Mussoorie, Rishikesh and Chamba are easily available from ISBT Kashmiri Gate. Buses and Taxis to Kanatal are easily available from major destinations of Uttarakhand state like Dehradun, Rishikesh, Haridwar and Tehri, Chamba and Mussoorie, etc. Nestled in the hidden terrains of the North East, Tawang boasts of a cultural and historical heritage. 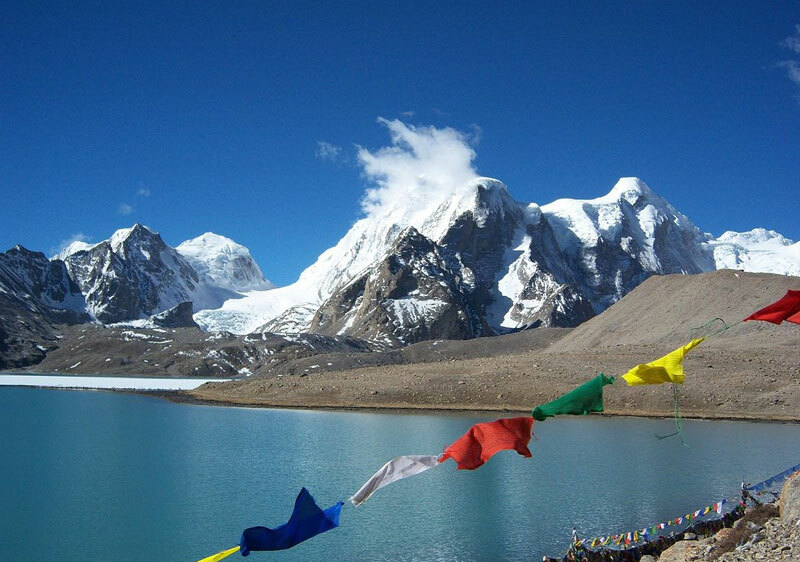 If crystal blue waters and glacial lakes are your thing, it’s time you visit Tawang. In case you own an adventurer spirit, you can always try rafting, trekking or even angling. 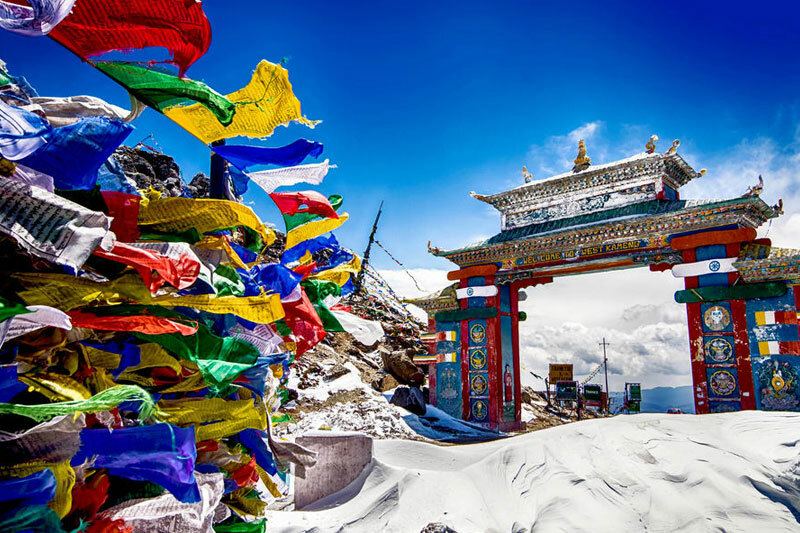 As the birthplace of the sixth Dalai Lama, it is a holy site for Tibetan Buddhists and a prominent center for Gelug or Gelugpa, the pre-eminent Buddhist school in Tibet. Tawang shares boundaries with Tibet in the north, Bhutan in the south west and Sela range of West Kameng in the east. By Road: Tawang is located in a remote part of India amongst the lofty Himalayan ranges. It does not have an airport or railway station of its own. 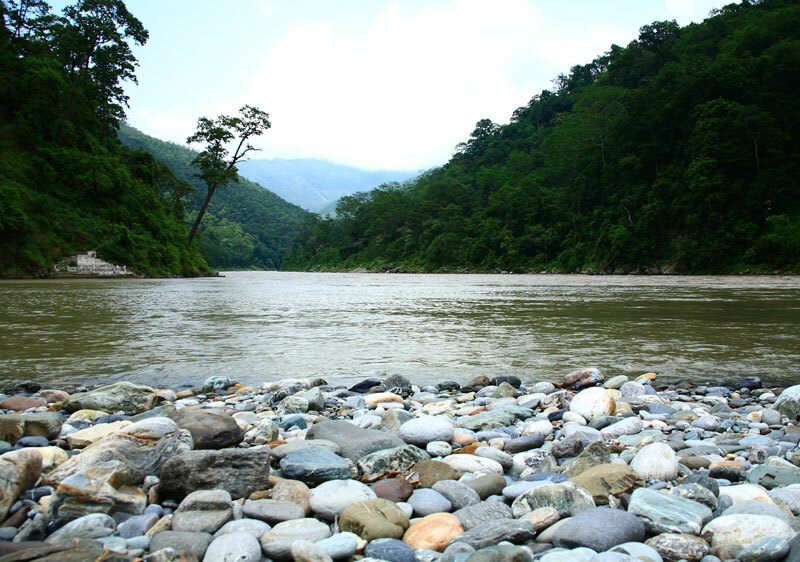 It is connected by road with other towns in Arunachal Pradesh and Assam via Bomdila. Tawang can be reached from the town of Tezpur in Assam by local bus (24 hours), while it takes 12 hours in a shared jeep. Best Time: Tawang is the cultural epicenter of Arunachal Pradesh, and one can visit here throughout the year. But the best time to plan a holiday will be during the festival season. The best time to visit Tawang is between the months of June and October. Loktak Lake is the largest freshwater lake in North- Eastern India, also called the only Floating lake in the world due to the floating phumdis (heterogeneous mass of vegetation, soil, and organic matters at various stages of decomposition) on it. 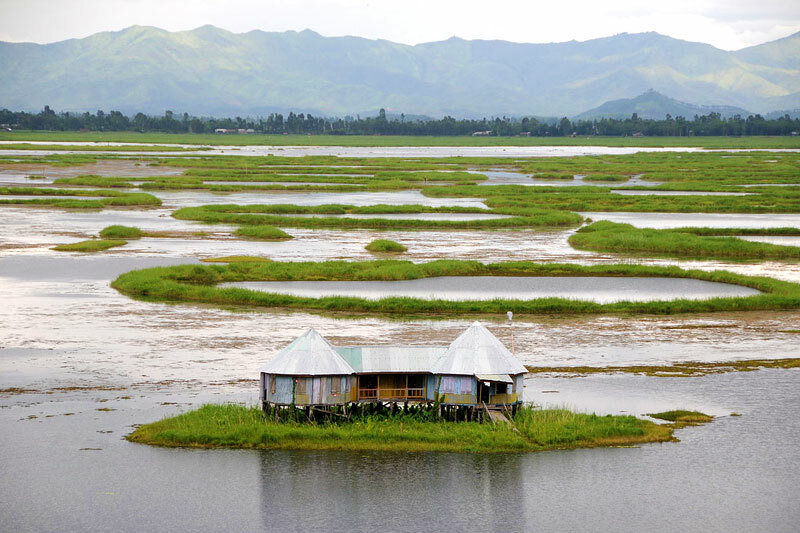 Loktak Lake is an intriguing ecosystem in the Northeast state of Manipur, which still remains largely untapped. 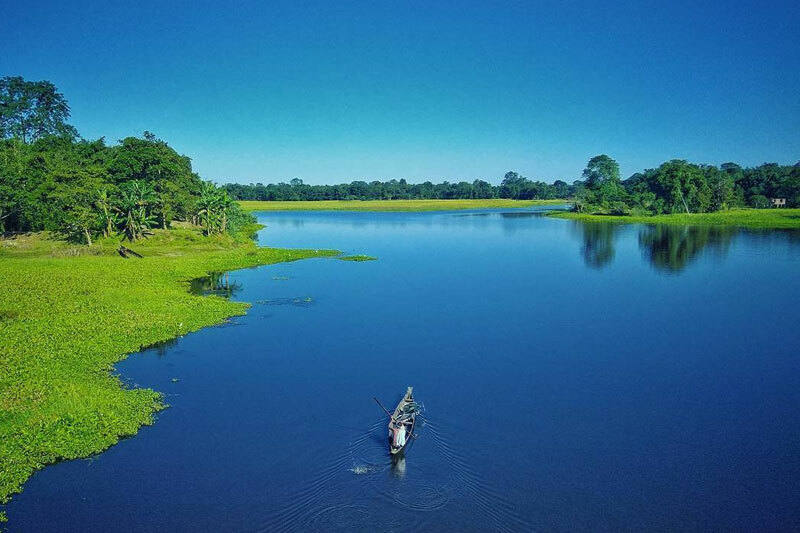 This wonder lake situated at a distance of 53 km from Imphal is, however, one of those places in Manipur where foreigners are allowed a visit. And the most interesting bit is—the lake is famous for floating islands. A view from above, Loktak Lake looks riddled with islands, but these in actual are not islands. If you’re wondering what could be special about a lake, have a look at this lake. Yes, you see these circular swamps? That’s the allure of the Loktak lake. Located in Manipur, Loktak is the largest freshwater lake in India. Apart from humans, this lake also houses 425 species of animals, more than 100 species of birds, and 233 species of aquatic plants. If luck is by your side, you will even witness the sight of sangai dancing deer roaming around the phumdis of Loktak Lake. This park, which was initially declared as a Sanctuary in 1966, was subsequently declared a National Park in 1977. Loktak is a birder’s paradise. The most commonly sighted birds in the region include black kite, northern hill myna, East Himalayan pied kingfisher, lesser skylark, lesser eastern jungle crow, Burmese pied myna, and more. 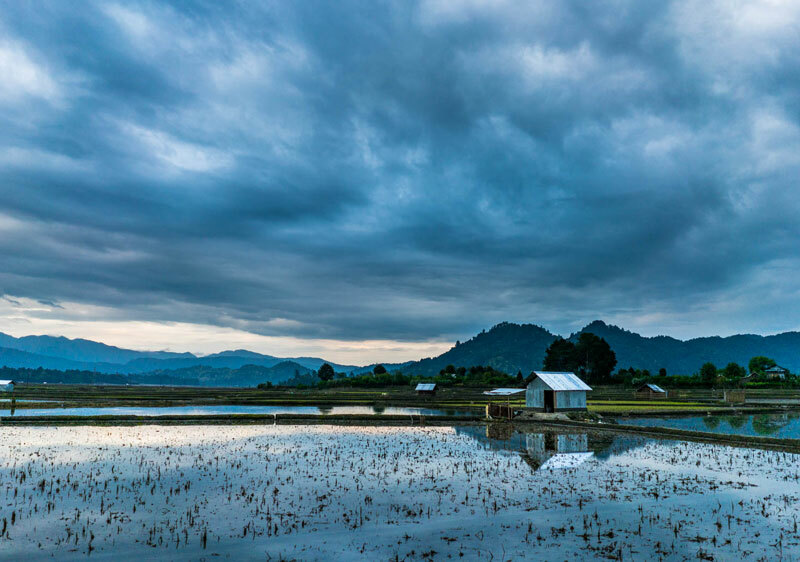 How to Reach: Loktak lake is located 39 km from Imphal, the capital city of Manipur which is well connected by road and air. Home to beautiful Olive Ridley turtles, Velas is one of the popular beaches in the district of Ratnagiri. Sharing close proximity with the Bankot bay, Velas is graced with the presence of an age old temple devoted to Shri Bhairi Rameshwar which is frequented by pilgrims from across the world who claims to attain ultimate salvation upon their visit to the temple. Velas beach, a village in Ratnagiri district is around 200 km south of Mumbai is leaving no stone unturned to save the turtles from disaster. Ten years ago, before the conservation effort started, most of the Olive Ridley turtle eggs were either consumed by humans, dogs and other wild animals. But with awareness and large-scale participation of locals, 19000 hatchlings have been released in the decade long effort. From the start of the nesting season beginning November, locals maintain a vigil for the female Olive Ridley turtles that come home to nest. Females lay up to three clutches per season, one clutch containing between 90-150 eggs. The eggs, size of ping pong balls, are collected and incubated in a hatchery constructed on the beach by the locals. Each clutch is marked by its date and left to incubate naturally. Let us welcome the tiny Olive Ridley’s during Velas Turtle Festival 2015. Velas Turtle Fest was held in March 2015. Velas is not only home to turtles but also to a myriad of bird species including the White Bellied Sea Eagle, White Backed Vulture, and Indian Swiftlet. Accommodation in a local home-stay will truly add a warm touch to the experience. 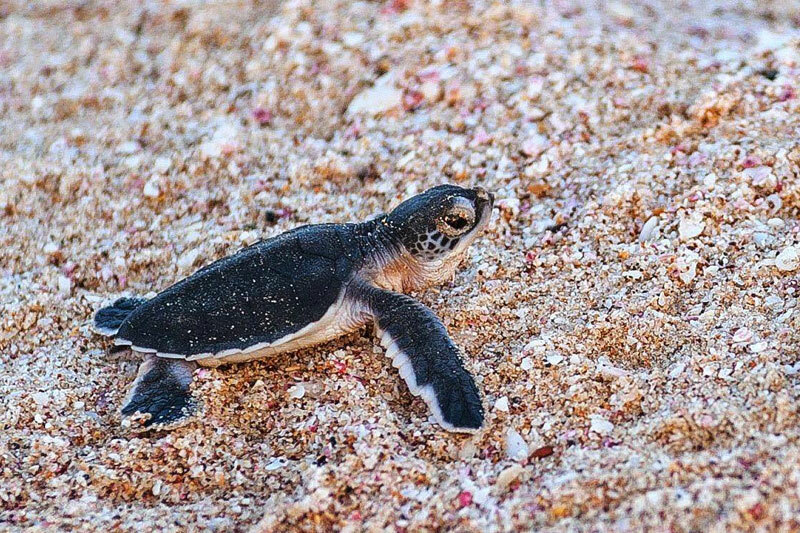 Much is in store on this Velas turtle festival tour, apart from turtle sightings. You can go on a village walk, go to the historic Bankot Fort and Harihareshwar temple and also satiate your taste buds by some truly authentic Konkani cuisine. How to Reach: Velas beach is well connected with prime cities in the state of Maharashtra. As one would find out while making their Velas festival online booking, roads are the most widely used medium of transport to reach the place. There are several bus travels from state run bus service and even by private tour operators as well to reach upto Dapoli or Mandangad from where you can take local transport ahed. Konkan Railways can also be put to use, if one wishes to reach here by train. Once can take trains till Chiplun and then onwards private vehicles can be hired to reach velas. Falling in the Ratnagiri district, Velas is a coastal village and is a way far from airport. If you thought all the pretty hill stations are captured by the north, think again. 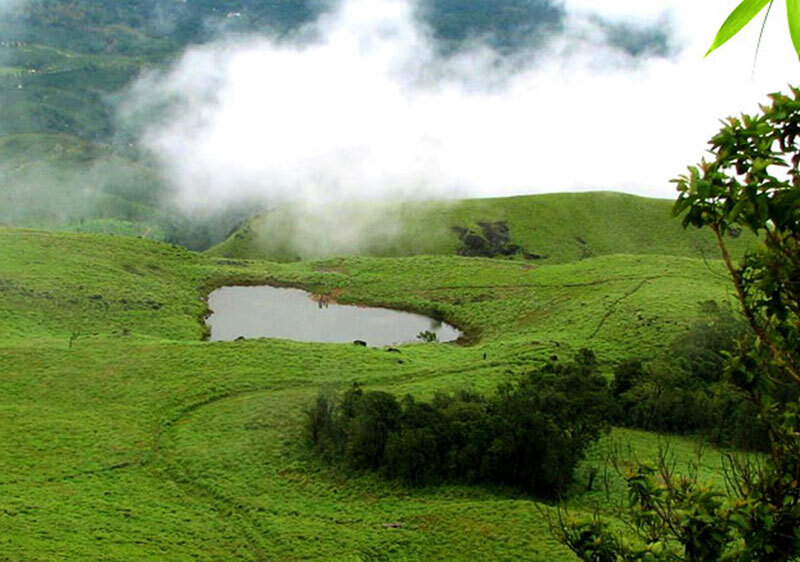 Situated 60 km away from the capital city of Thiruvananthapuram, Ponmudi boasts of winding pathways and enchanting views. 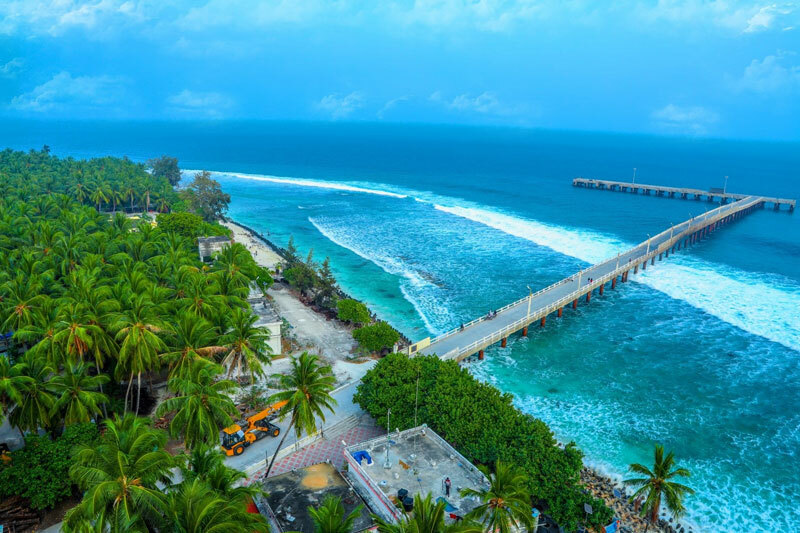 Let’s not forget our beautiful Union Territories – Lakshwadeep Islands. Kavaratti Island is the capital of Lakshwadeep. Did you know that Lakshwadeep possesses some of the prettiest corals ever?! This simply means, hello scuba diving! Kavaratti Island serves as the capital of the Union Territory of Lakshadweep. Tourism is the primary industry here. Lakshadweep is known for the white sand beaches. Pristine white sand shores and the endless lagoons in Kavaratti Island keep you amazed. Kochi is around 403km to Kavaratti Island and it is the nearest city on the Indian mainland. Kavaratti Island is also base for INS Deeprakashak, one of the main Indian Navy Base. Kavaratti has been an important Indian Navy Base since 1980's. However, INS Deeprakashak was commissioned in the year 2012. Water Sports are a big hit in Kavaratti Island and there are wide ranges of activities for the visitors. Scuba Diving, Snorkelling, Water Skiing, Parasailing, Jet Skiing, Water Bikes, Wind Surfing and Glass Bottomed Boats are some of the famous water sports to try in Kavaratti Island. How to Reach: Agatti Aerodrome is the nearest airport to Kavaratti Island. Kochi airport is the nearest one in the Indian mainland. Tourists can also go on ship voyage to Kavaratti from Kochi. There are separate passenger ships for locals and tourists and it is an overnight journey from Kochi to Lakshadweep. Kavaratti Island can also be reached through helicopters from Agatti Island. With the distinction of being the wettest place on earth, Mawsynram is a mesmerizing little village in the Indian state of Meghalaya. Located in the Khasi Hills, Mawsynram is famous for its rains. The green village is surrounded by hills and floating clouds overhead are a daily sight. Mawsynram is situated 1400 meters above sea-level. The alignment of Khasi Hills is responsible for the heavy rainfall over Mawsynram. It receives an astounding average rainfall of 11,872 millimeters. The rains of Mawsynram are so powerful that the villagers use a thick layer of grass in order to sound-proof their homes. The village derives its name from the megaliths found in the Khasi Hills. 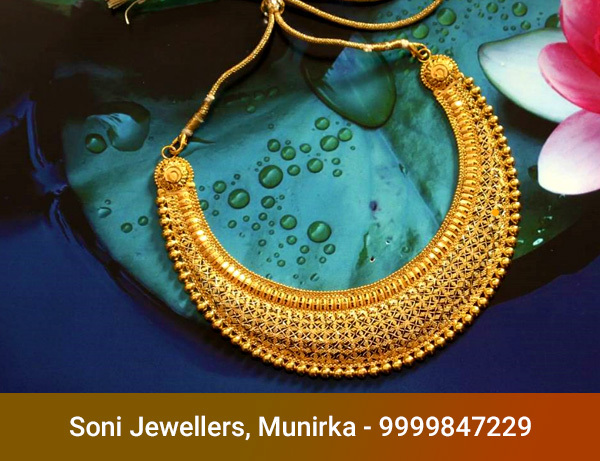 Maw comes from a Khasi word, meaning ‘stone’. There is a famous cave by the name of Mawjymbuin located nearby, known for its fascinating stalagmites. These take the shape of a ‘Shivlinga’. 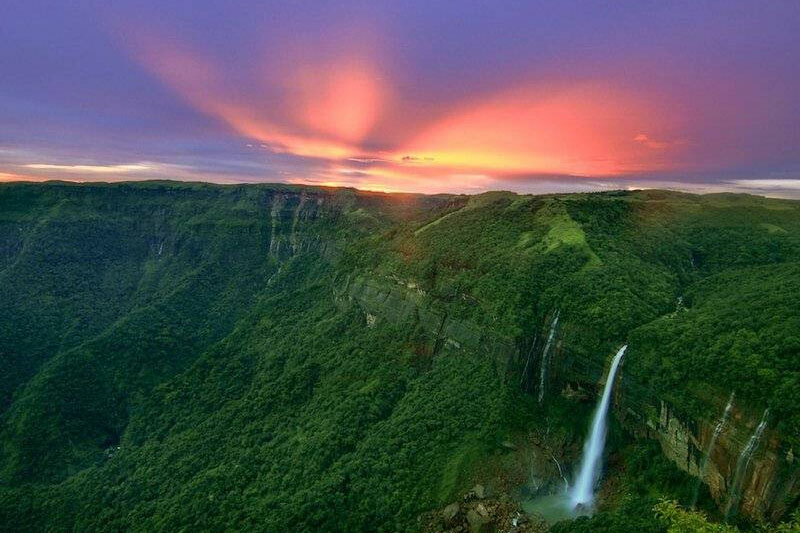 The sliding slopes, rolling green mountains, blooming orchids, deafening waterfalls and mesmerizing rains of Mawsynram makes it a fascinating tourist destination. The Khasi Hills provide for a beautiful backdrop. It is an ideal place for the nature buffs. How to Reach: Shillong Airport feeds as the nearest airport to Mawsynram. It connects all the major cities and states nationally as well as internationally. You can take a cab or local transport bus to cover a distance of 86 km between the Airport and Mawsynram. It will take 3 hours for you to reach Mawsynram from the airport. On your way to the destination enjoy the scenic beauty and pleasant weather of the place. Otherwise, if you do not have a direct flight to Shillong choose the one that lands in Guwahati. Furthermore, choose taxi or car to travel to travel a 70 km distance to Shillong. Mokokchung is an ancient village belonging to Mokokchung District of the former Naga Hills of Nagaland. The word Mokokchung when literally translated means a group of people who left their motherland rather unwillingly. History has it that a group of Soyim people settled here after leaving Soyim despite the requests of other Soyim residents. 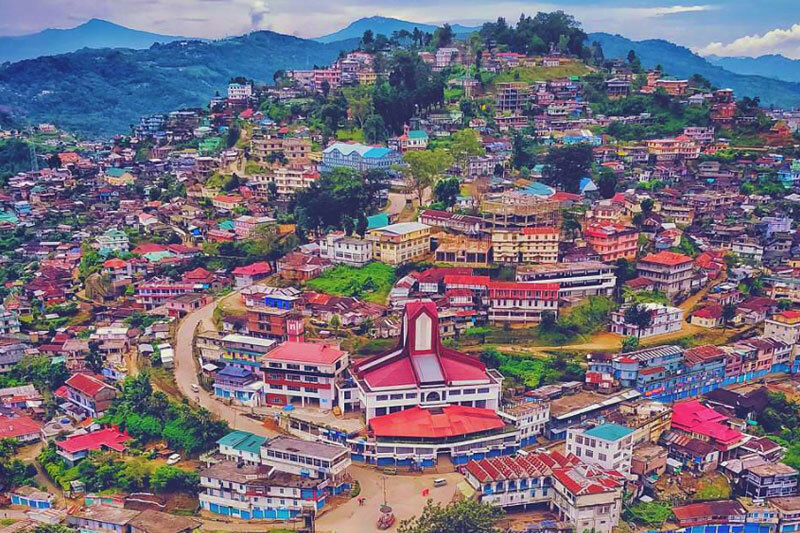 Mokokchung Village is one of the largest villages of Nagaland and one of the major places where you can see the descendants and cultures of the tribe AoNaga. People who wish to explore North-east India, make plans to explore Mokokchung District. The ‘village’ is as large as a district as a whole has become a quite popular tourist attraction over the years. This old village has several clans residing who speak in a singular dialect of Mongsen. 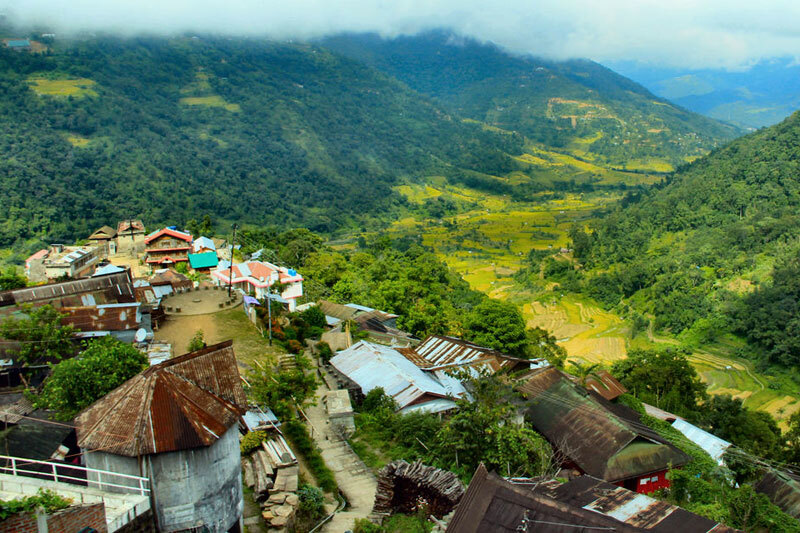 It is a part of the most culturally rich and intellectual district of Nagaland. To honour and respect their traditions and culture, the people of Mokokchung Village celebrate the festivals of Moatsü and Tsungremong with great mirth and vivacity. Moatsü is celebrated to honour the creator of the Earth and prayers are asked for a fruitful cultivation season. Tsungremong is held during the 1st week of August to celebrate successful harvesting. After embracing the religion of Christianity, the people of Mokokchung Village grandly celebrate the festival of Christmas. You can visit the village during the festival times to witness the energy and joy of the villagers. Mokokchung Village is one of the places to visit in Mokokchung District because of the way they hold on and revere their cultural heritage. How to Reach: There are options of local transport like taxis from the airport of Dimapur (194.6 km). There is no railway station in Mokokchung Village; however, you can take the rentals cars from Dibrugarh Railway Junction and reach this village (207.2 km). Best Time: Mokokchung Village enjoys a warm summer where temperatures range below 32 degree Celsius and experiences heavy rainfall between the months of June to September. Winter is a comfortable season to enjoy your vacation in Mokokchung Village, Nagaland. If you’re more a beach person, then this one’s for you. Talasari is a secluded beach with swaying palm trees. This beach is soon going to become a tourist spot, so get going already! Ever wanted to visit a ghost town? Here’s your chance. Situated at the tip of Tamil Nadu, it is a town which holds a rich religious value. Khonoma is Asia’s first Green Village. 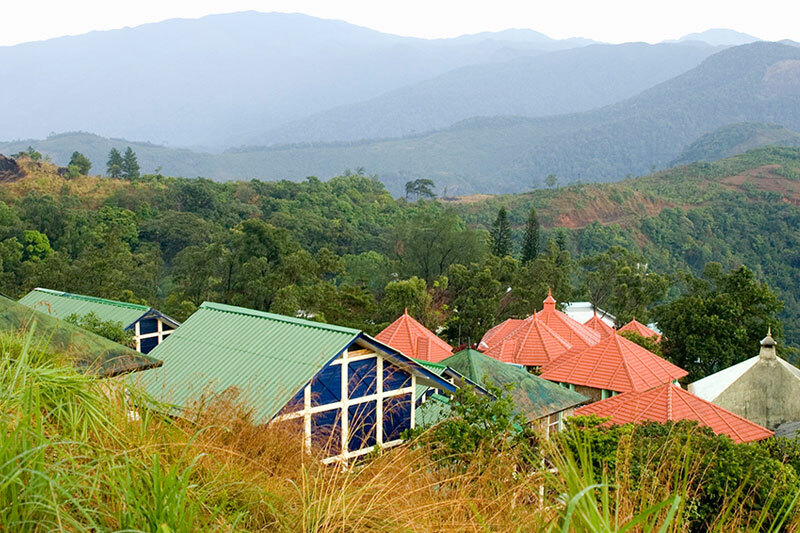 Tucked in the North Eastern charms of Nagaland, it boasts of scenic views of the valley. Khonoma is also known for its war memorial. 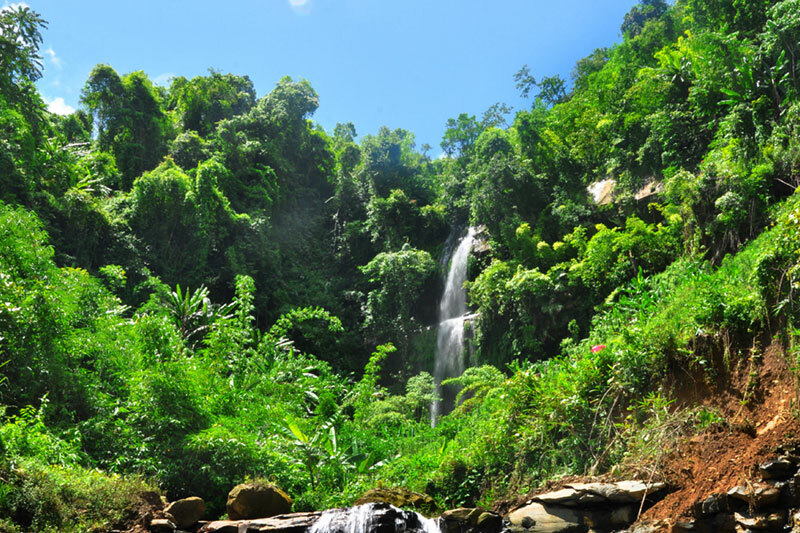 Tamenglong is the absolute perfect setting for a nature enthusiast who enjoys being outdoors. The Manipur cuisine is a must try. 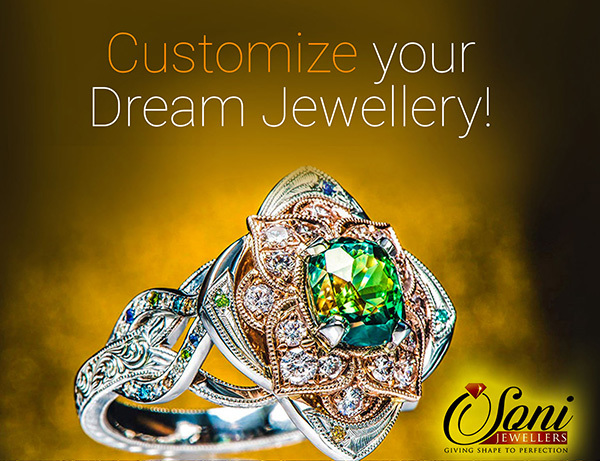 The flavourful curries and exotic spices are sure to life your spirits. 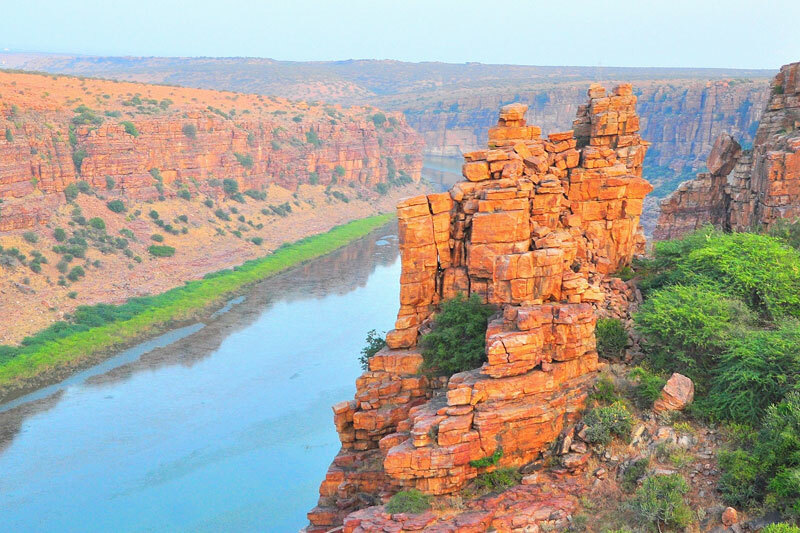 A small village located right on the bank of the river Pennar in the Kadapa district of Andhra Pradesh, Gandikota is also known as the Grand Canyon of India. Getting there might be a bit of an adventure, but once you're inside the place, there are no means of transportation. Thank god for that. One really needs to spend time enjoying what Gandikota has to offer. There is a great downhill trek through the canyon leading to the riverbed. India's answer to the Grand Canyon, Gandikota in Andhra Pradesh is a amazing place to visit. 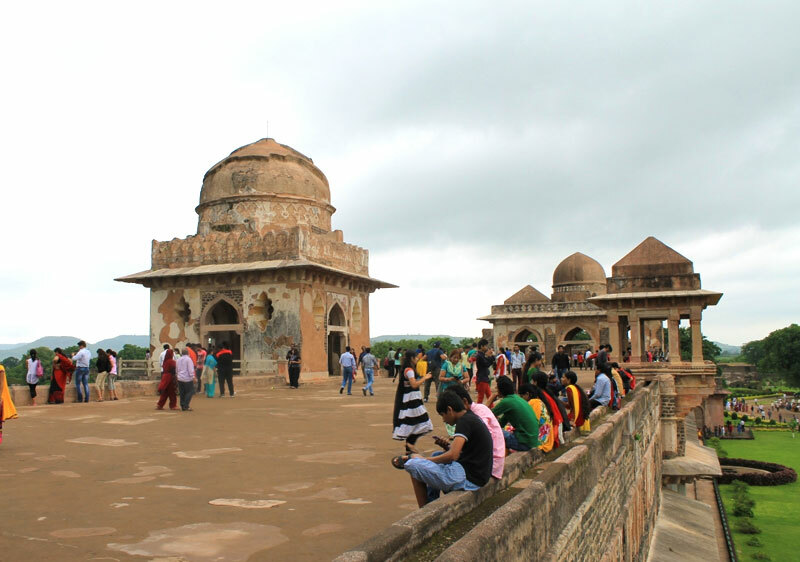 The village has a fort, some temples and even a Jamia Masjid. But the best part about this place is the Pennar river, which cuts through the canyon. Still a relatively quiet place, this village has huge potential for tourism. How to Reach: The closest railway station is 26 kms away at Muddanuru in Cuddapa district. The nearest place to take a bus ride would be Jammalamadugu (nearest town) Old Bus Stand (Gandhi Statue Junction). A coffee enthusiast would know the importance of Araku valley. Famous for its coffee plantations, India’s first tribal growers' organic coffee brand was launched in the Araku Valley in 2007. The premium organic "Araku Emerald" brand of coffee sells globally. 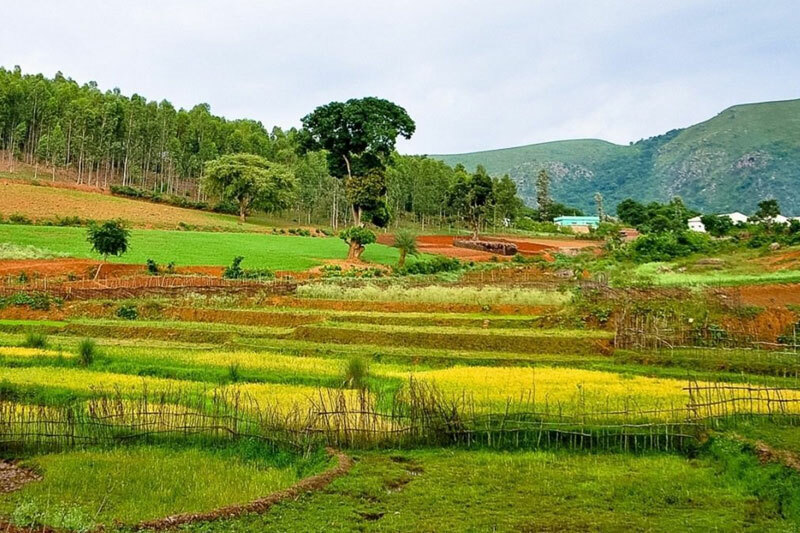 Inhabited by different tribes, Araku is a hill station in the Vishakapatnam district. A perfect getaway from the hustle-bustle of the city, this valley is surrounded by mountains like Galikonda, Raktakonda, Sunkarimetta and Chitamogondi. How to Reach: The valley is connected by both rail and road to the city of Vishakapatnam. There are two railway stations at Araku on the Kothavalasa-Kirandul railway line of Visakhapatnam division of the East Coast Railway, on the Indian Railways network. Shimiliguda railway station is located at an altitude of 996 meters above mean sea level. Beautiful, and mostly untouched, this one's been waiting for you to be explored. Make no mistake, the Belum Caves are the second largest caves in the Indian subcontinent, and the longest (3229 mts) caves in the plains of India. Formed in black limestone, the caves have long passages, spacious chambers, fresh water galleries and siphons. 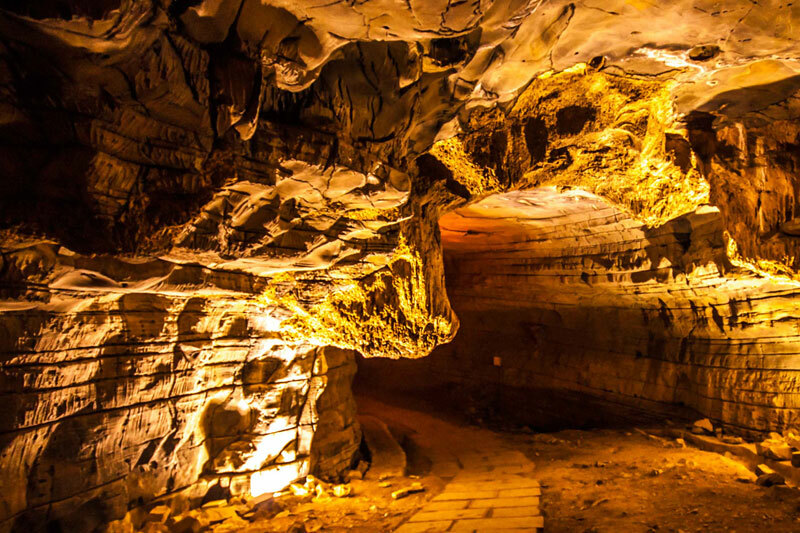 The constant flow of underground water helped forming caves that have their deepest point at 150 feet. Engulfed in mystery, there are 16 different pathways, including the main entrance. Moreover, there are deposits of quartz in the caves. How to Reach: The nearest rail-head to reach Belum Caves is Tadipatri, which is 30 kms away. 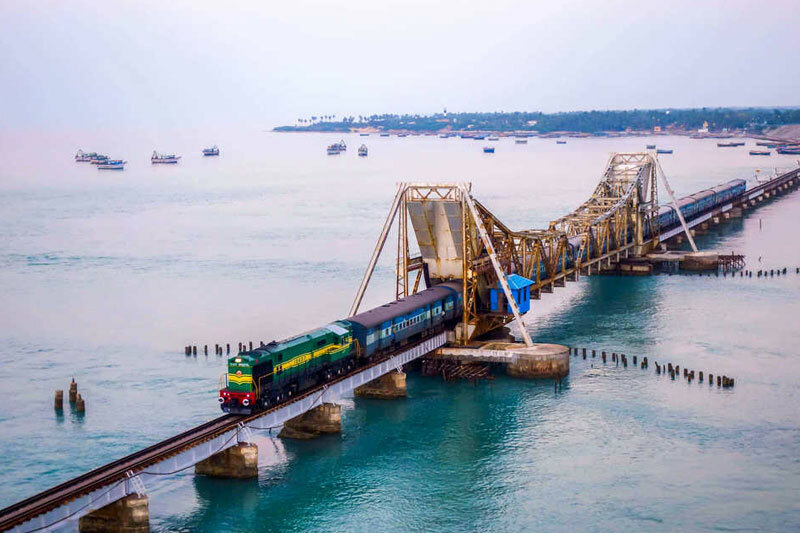 There are daily trains from Delhi, Mumbai, Chennai, Hyderabad, Tirupati, Kanyakumari, Thiruvananthapuram, Coimbatore and Goa, which halt at Tadipatri railway station. From Tadipatri, one can catch a bus to Belum Caves. If you feel somewhat like Indiana Jones, this one must be explored. 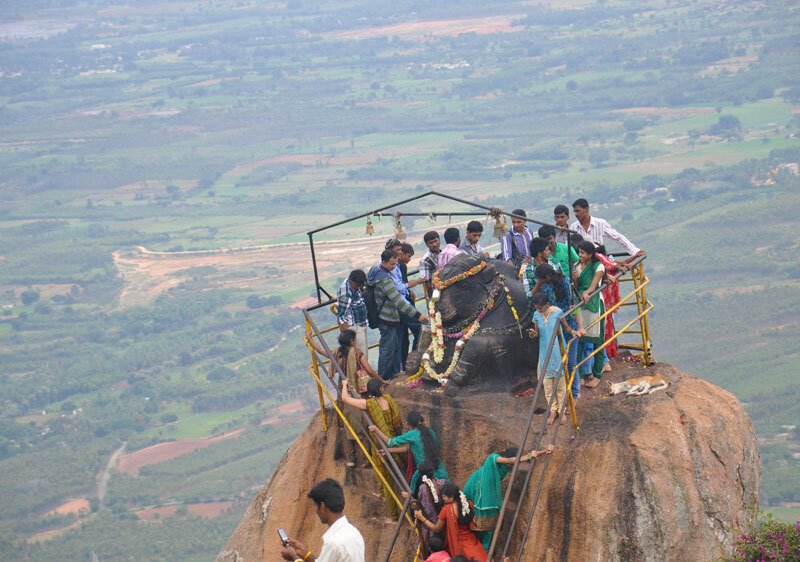 Also known as Kalavara Durga, Skandagiri is a mountain fortress located just 70 kms from the city of Bangalore. Although much hasn't been written about the place, the gorgeous photographs suggest that it's a perfect weekend trip for people living in Karnataka. How to Reach: Off Bellary Road (National Highway 7 Hyderabad-Bangalore Highway), and overlooking Nandi Hills and Muddenahalli, this place guarantees a breathtaking view at an altitude of about 1350 mts. One look at this place, and you'll be in love. Just look at the picture! Situated in Athirappilly panchayath, Chalakudy Taluk of Thrissur district, Kerala, this 80-ft-high waterfall is quite a hotspot for the people living nearby. 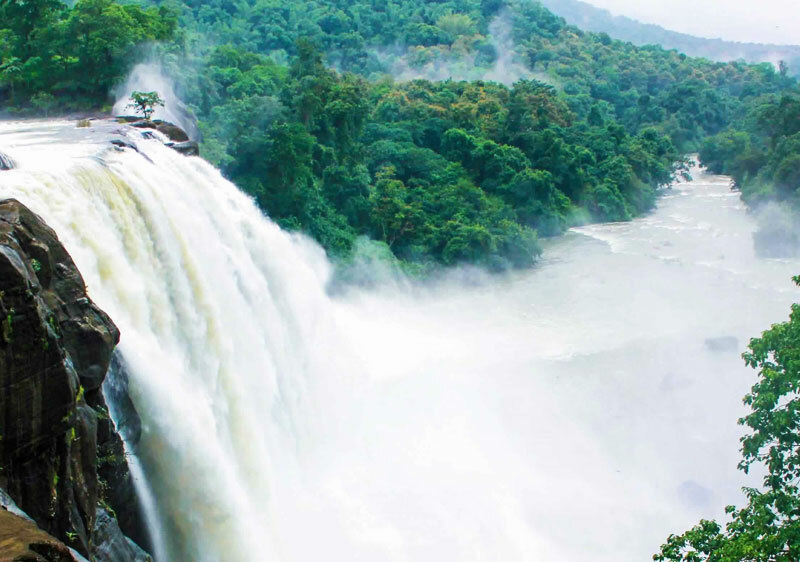 Nicknamed the 'Niagra Falls Of India', Athirappilly is the largest waterfall of Kerala. Narrow winding roads, small villages and greenery make for a delightful sight as you make your way up there. 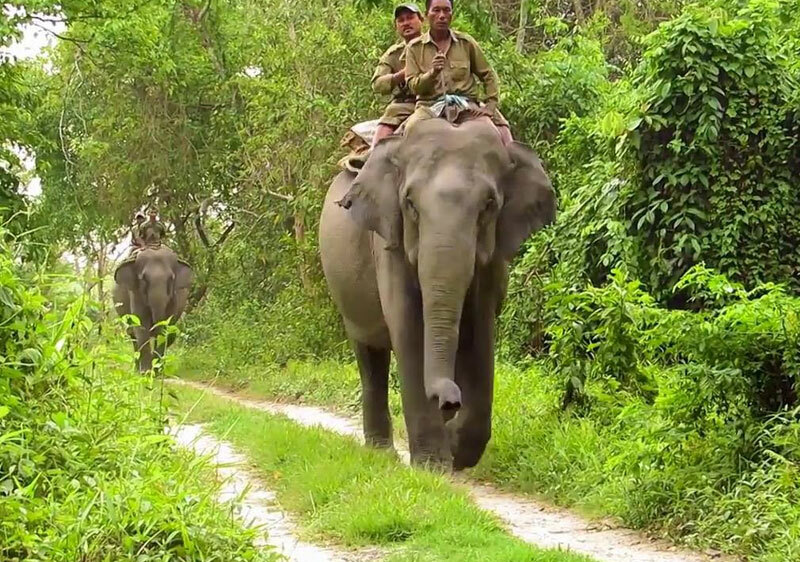 Daily jungle safari trips are organised by Thrissur District Tourism from Chalakudy to Malakkappara. The captivating sight of the wildlife through the evergreen forest of Sholayar ranges of Western Ghats is a memory to cherish. How to Reach: You'd find the nearest railway, Chalakudi railway station, 30 kms away. Kochi is the nearest airport, about 55 kms away, if that's your preferred mode of travelling. Athirappilly is easily reachable from Chalakudy by taxi or by bus from the Chalakudy private bus terminal. The quest for peace and tranquility is making people explore beaches apart from the usual ones in Goa. So if that's what you're looking for, Maravanthe fits the bill. Located on one of the best stretches of road, you'll find the beach on one side, and a river on the other as you drive on from Mangalore towards Karwar, Goa, or Mumbai. 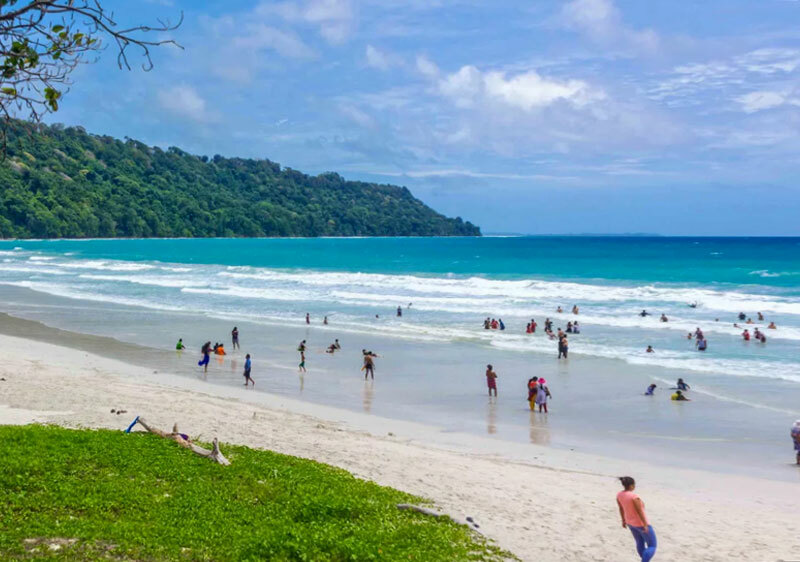 One of the cleanest beaches in the country, it can also get pretty dangerous during high tide, so it's better to be cautious, and avoid the area during the monsoons. How to Reach: There are places where you can stay on the highway, but a better alternative would be staying at the nearby town of Kundapura. You could also go fishing with the locals at the nearby Gangoli port. Only about 55 kms from Udupi, this place should be on your list of places to visit in India. I have actually been lucky enough to visit Kudle beach the last time I took a trip to Goa, and I recommend it to all. With just a few shacks on the beach, this place is just perfect to chill. It is also one of the lesser known places in the area, and you'd actually find more foreigners than locals. 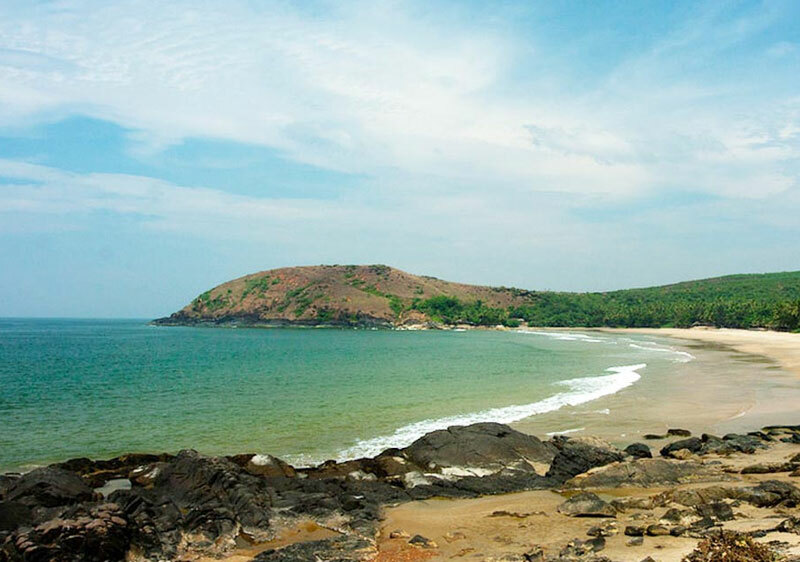 For those who don't know, there are five beaches in Gokarna - the Gokarna beach, Kudle, Om, Half Moon and Paradise. Each prettier than the other. 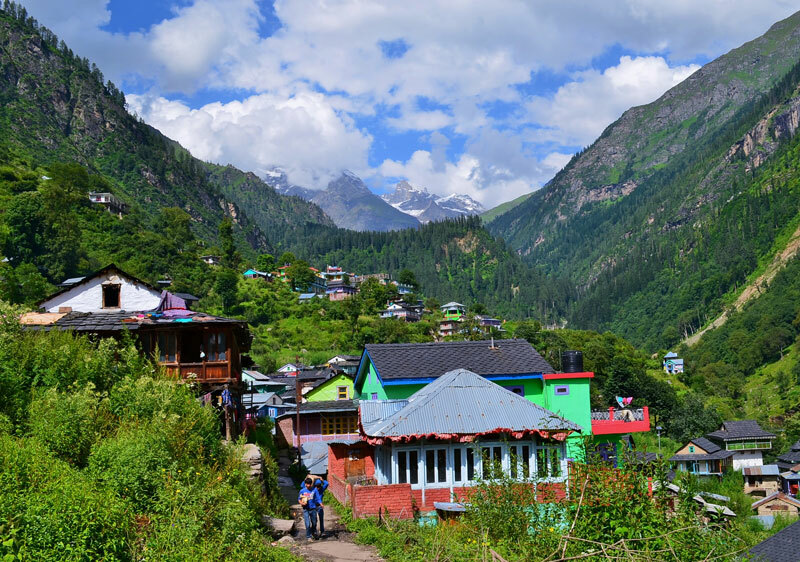 The town is like any other, but the small trek that one needs to do before reaching Kudle is what makes it all the more special. It's clean (unlike most beaches in Goa), completely secluded, incredibly gorgeous, and most importantly, calm. How to Reach: The best way to visit would be from Goa. 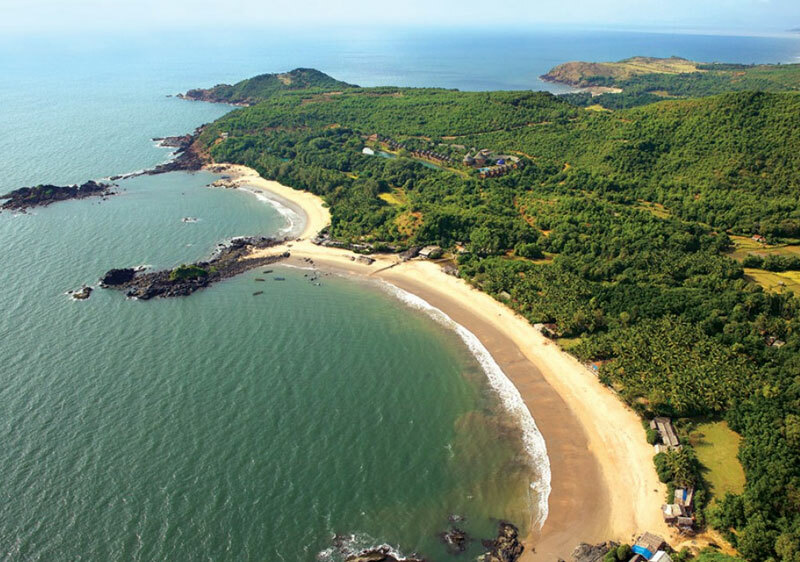 Just 91 kms from Dabolim airport, the beauty of Gokarna is only a couple of hours away from South Goa. 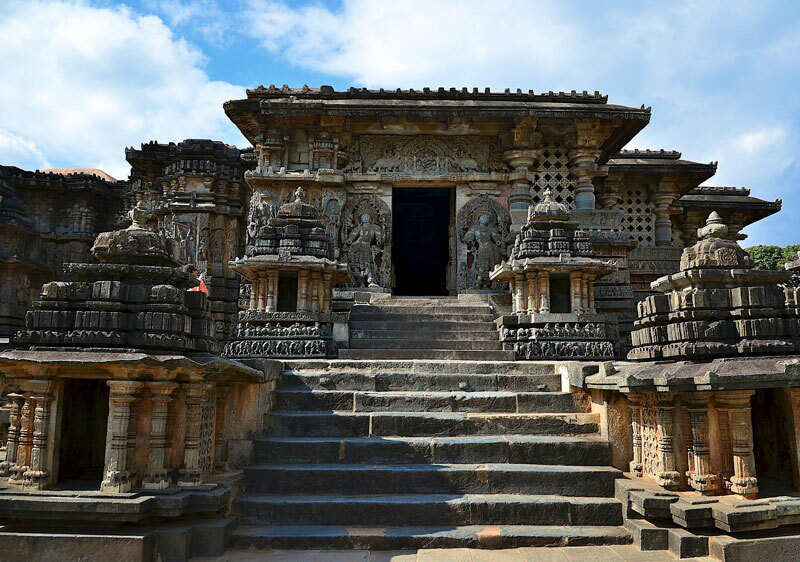 Halebidu, or old city, was the regal capital of the Hoysala empire in the 12th century. Rich in architecture with the beautiful Kedareswara temples, the city, which was originally called Dorasamudra, got the name "Halebidu" because it was ransacked twice during the invasion of Malik Kafur. The town is untouched by tourist crowds and a beautiful offbeat experience. Known as Dwarasamudra, gateway to the seas, Halebid is the capital of the Hoysala Dynasty for about 150 years. Sacked by the armies of Malik Kafur in the early 14th century, the town fell into a state of ruin. Even in the ravaged state, the town glory still remains undiminished. Spend time exploring the temple ruins of Halebid. You can also combine your tour with a visit to Belur along with Jain monuments at Shravanabelagola. It's also only 16 km away from another historical place, Belur. How to Reach: It is well connected by road and rail from Bangalore. This temple is now being proposed as a UNESCO World Heritage Site. 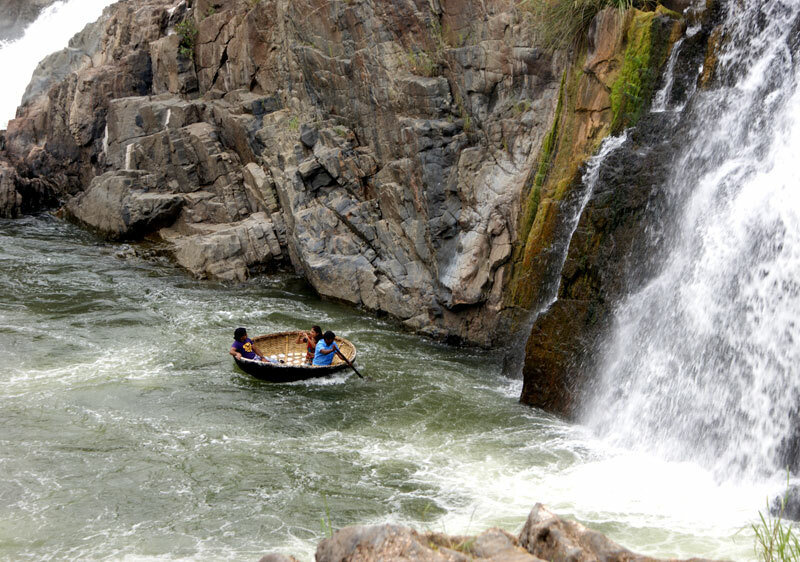 Hogenakkal is famous for medicinal baths and hide boat rides. Some say that the freshly fried fish served by the village women at a shore during the boat ride is a highlight of the trip. Apart from this, unfortunately, there isn't a lot of information available about this place. Guess one needs to explore and find out. What separates it from the rest is that this mountain is shaped as a shivalingam and a spring flows nearby, locally called "Ganga", thereby by giving the place its name. Some even like to call it Dakshina Kashi (Kashi of the South). Bangalore locals say that a day is enough to explore all Shivgange has to offer. Getting to the top of the hill is a bit of a trek (20 minutes to be precise), and as you climb you will get to see the most beautiful 360-degree view of what surrounds it. How to Reach: Situated 20 km from the town of Tumkur and 54 km from Bangalore, Shivagange is a mountain peak with a height of 1368 mts and a Hindu pilgrimage center located near Dobbaspet. This one's truly a one-of-a-kind type of place to visit. 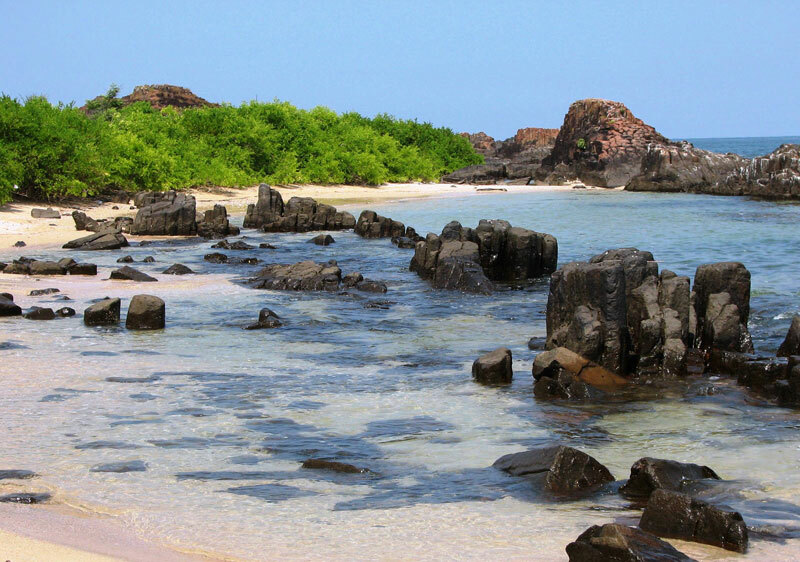 St. Mary's Islands, also known as Coconut Island and Thonsepar, are a set of four small islands in the Arabian Sea off the coast of Malpe in Udupi, Karnataka. They are known for their distinctive geological formation of columnar basaltic lava (check out the rocks in the picture). On research it came up that the basalt of the St. Mary's Islands was formed by sub-aerial sub-volcanic activity around 88 million years ago when Madagascar was attached to India. Since there are no roads connecting the island, the only way of getting to the islands is by boat. Regular ferry services ply the 6-km distance from the Malpe fishing harbour (which has a ship building yard as well) to the islands. However, the frequency of these boats may vary depending on the number of tourists visiting. Another hidden gem that doesn't have much written about it. Papi kondalu or the “Papi Hills” are a series of mountains that are located in Rajahmundry in West Godavari District of Andhra Pradesh. Simply put, Papi Hills is a just a gorge, but it's a gorgeous gorge. 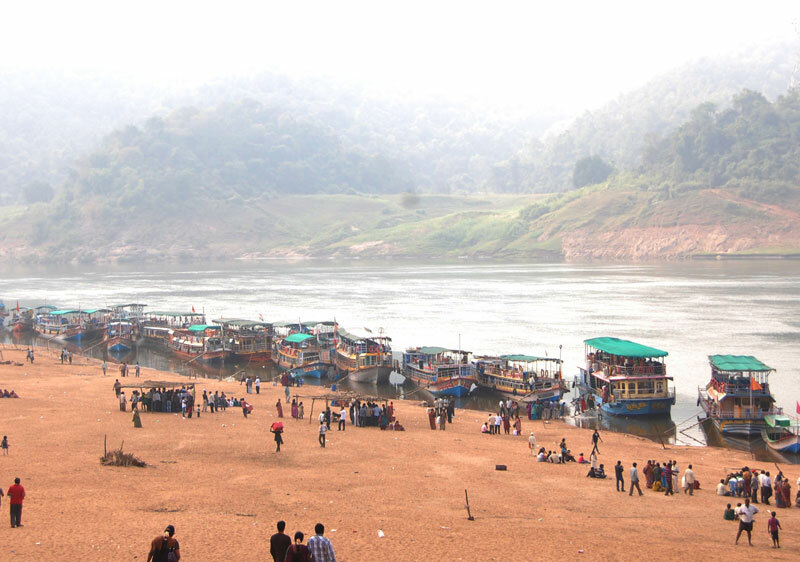 A boat trip on the Godavari river in the Papi Hills region is quite spellbinding and romantic. Boat trips are available from Bhadrachalam, Rajahmundry and Kunavaram. You can choose from a wide variety of trips depending on the time limits. Kunavaram offers the fastest and cheapest way to check out the hills. Tour boats locally called "Launches" are the main transport vehicles. How to Reach: There are two entries to Papi Hills, from Kunavaram or from Rajahmundry. Kunavaram is reachable by road from Hyderabad (351 km), Khammam (170 km) and Bhadrachalam (49km). You can hire a boat or join a tour. Rajahmundry also offers boat services to Papi Hills. 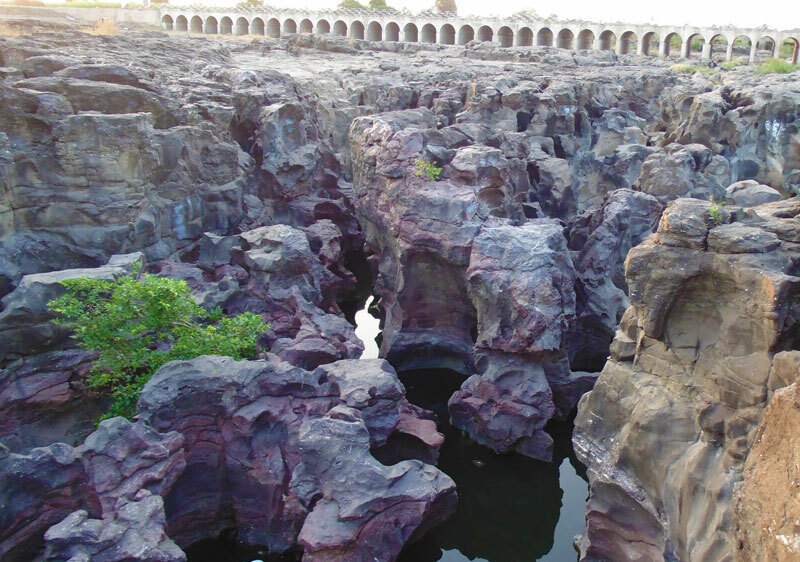 Nighoj is famous for the unusual but naturally created potholes on the Kukadi riverbed. Geologists say that sometime in the past, the Kukadi river must have flowed out of the highlands and hit the rocks with such force that it resulted in these potholes and even a gorge that runs along the riverbed. How to Reach: Situated 90 kms away from Pune, this village in the Ahmednagar district of Maharashtra. Unexplored and abundantly blessed with plenty of wildlife, we come to the next offbeat destination India on our list, Tadoba. The town in Maharashtra is known for Tadoba National Park, Tadoba-Andhari Tiger Reserve, Tadoba Lake, Erai dam, Moharli and Khosla village. It is often named as the ‘Jewel of Vidarbha’. 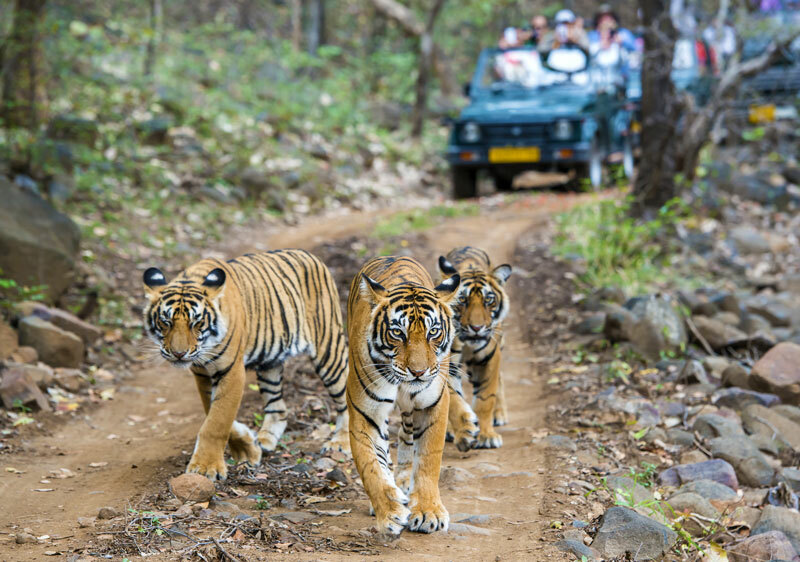 Perfect for wildlife vacations and to spend time away from cities, Tadoba is one of the best kept Tiger Reserves in India and the largest in Maharashtra. Go for safaris or opt for a jungle stay. Imagine a monastery built like a honeycomb. Well, you don't really have to if you've seen the Phugtal Monastery in Ladakh. This cliff-side monastery was built in the 12th century and it houses about 70 Buddhist monks. The foundation of the entire thing is merely built with clay and twigs. The monastery is built right under a cave entrance on the cliff. The earliest inhabitants of the cave were the 16 legendary followers of Buddha, whose images can still be found on the cave walls. Mawlynnong in Meghalaya, is one of the must visit offbeat places in India. Blessed with the charm of North East India, Mawlynnong has been awarded as the cleanest village in Asia in 2003. 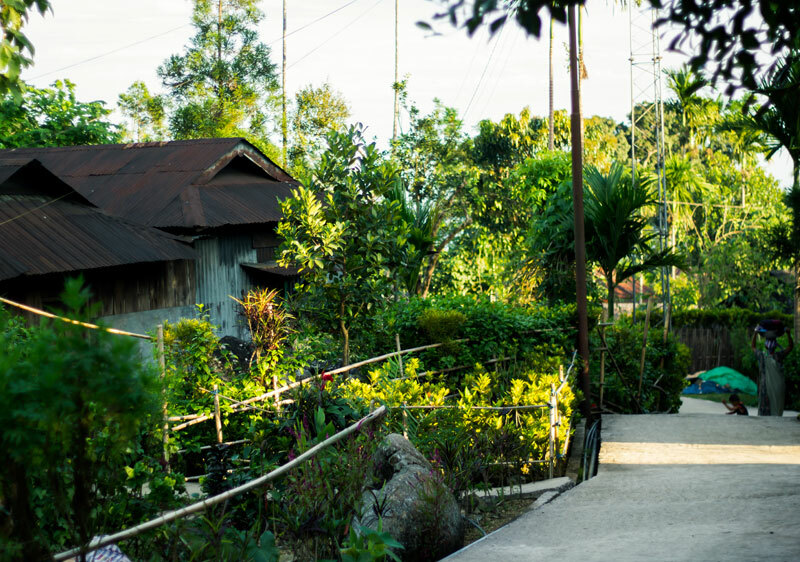 The eco-friendly village community will give you some amazing lessons on life. The scenic bliss of the town is refreshing for your senses. There are waterfalls to visit, caves to explore and most importantly walk on the Living Roots Bridge. Created out of the roots of the trees, the bridges are truly a wonder. Don’t’ stop at just this town, backpack throughout Meghalaya. How to Reach: Mawlynnong is at a distance of 90 kilometers from Shillong. Shillong has its own airport too, called Bara Pani; but since very few people know about it, most end up landing at Guwahati. An exciting trekking trip, the Chembra Peak in Kerala is one of the best offbeat destinations in India. It is located in Wayanad district, at 6,900 ft in the lush lap of misty Western Ghats. 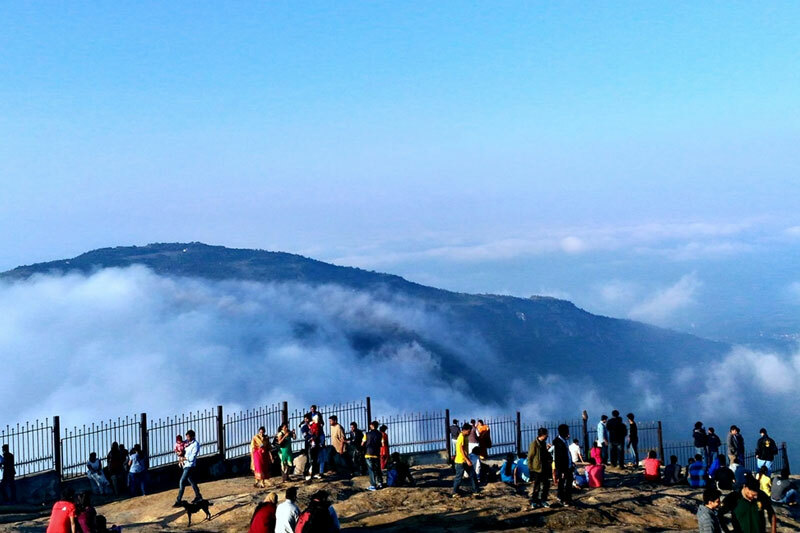 The peak is popular for adventure enthusiast trekkers and nature lovers. To get to the peak it’s mandatory to get permission passes from the Forest Department for the safety of trekkers and preservation of wildlife. How to Reach: En-route to the peak, a heart shaped lake locally named Hridaya Saras, enchants the visitors. From the peak you can enjoy panoramic views do the environs. Ladakh is itself offbeat, favored by adventure lovers. One of the less talked about places in Ladakh, Hemis is a beautiful place surrounded by snowcapped ranges all around. 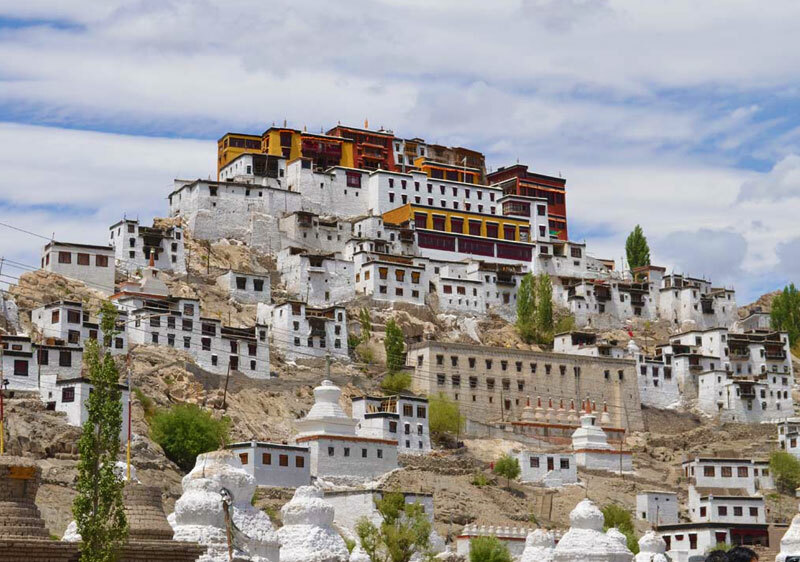 Pay a visit to the Hemis Gompa. The monastery is beautiful and one needs to spend time here. The Hemis National Park, the home to the snow leopard is thrilling. Carry your camera, if luck favors you can capture a click. Hemis makes you forget buzzing cities. Enjoy the simple pleasures and spend night stargazing, you will truly love it. Of the many beautiful beach towns, Gokarna is one of the offbeat secrets of India. Famous for its pristine, unspoilt beaches, Gokarna is a temple town primarily, with a slow and relaxed atmosphere, which makes for a very pleasurable offbeat holiday. 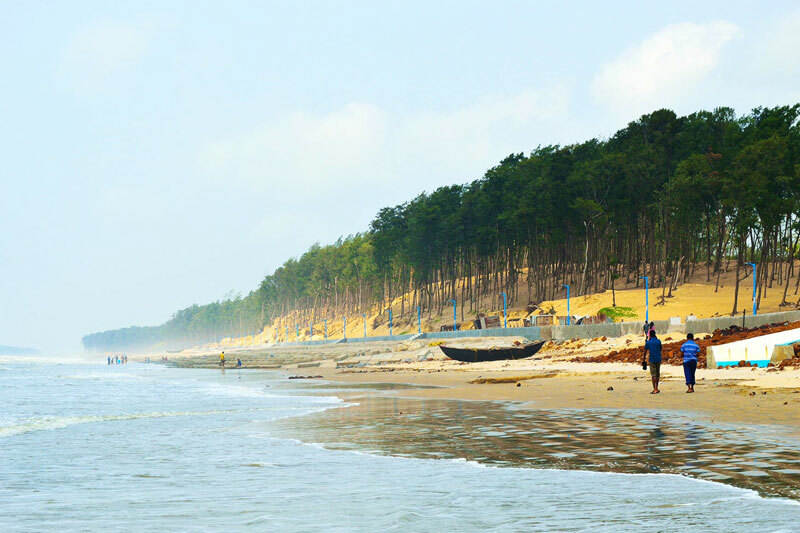 Away from crowds, the shores of the Karnataka town is drenched is beach bliss. Hire a motorbike and explore the town. Pay a visit to the ancient temples. Enjoy watching the sunrise and sunset. Go for a swim in the waters anytime. The shacks on the beach have great food, great music and interesting people. A gem of North East, Manas National Park at the foothills of the Bhutan-Himalayas in the state of Assam is one of the awesome experience. It is one of the first reserves of Project Tiger in 1973 blessed with unique biodiversity and landscape. The wildlife sanctuary has substantial population of Royal Bengal Tigers and was inscribed as World Heritage Site. The last species of Pygmy Hog survive in the wilderness of Manas and nowhere else in the world. It is one of the offbeat places in India, where adventure abounds and tourist can have a wonderful time. 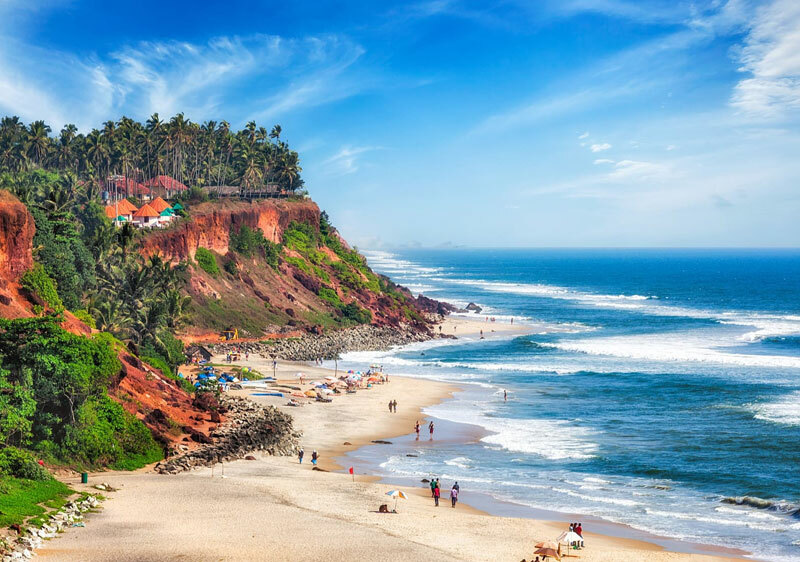 Snuggled on the shores of Arabian Sea, Varkala in Kerala is a quaint paradise. Replete with clear, pristine beaches, hills, shrines, lighthouses, the beach town is one of the best offbeat places in India. 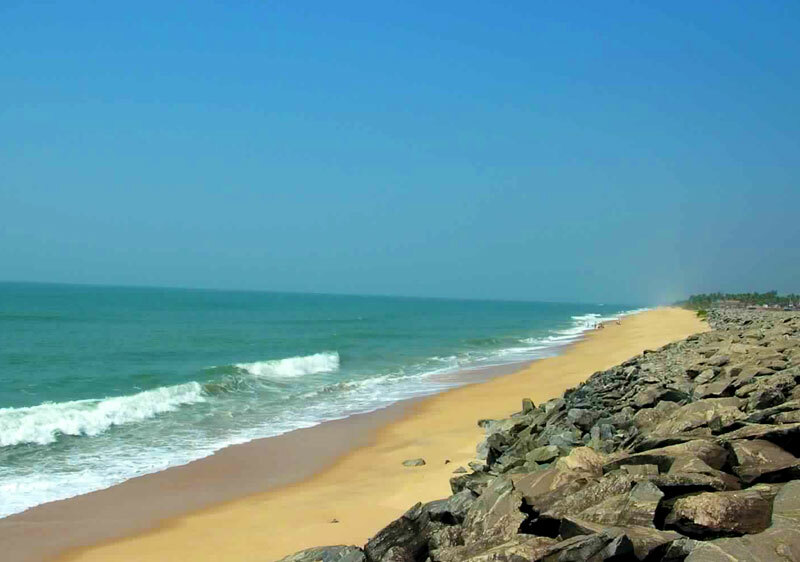 Once you are here, pay a visit to Papanasam beach, where sadhus perform holy rituals. A holy spring flows by where pilgrims take a cleansing bath. Treat yourself to adventure sports like paragliding and parasailing. Escape the cities, the crowded shores and come to Varkala for a quiet vacation. Opt for Ayurveda or learn yoga and meditation. Go swimming, sunbathing or just sit on the shores. 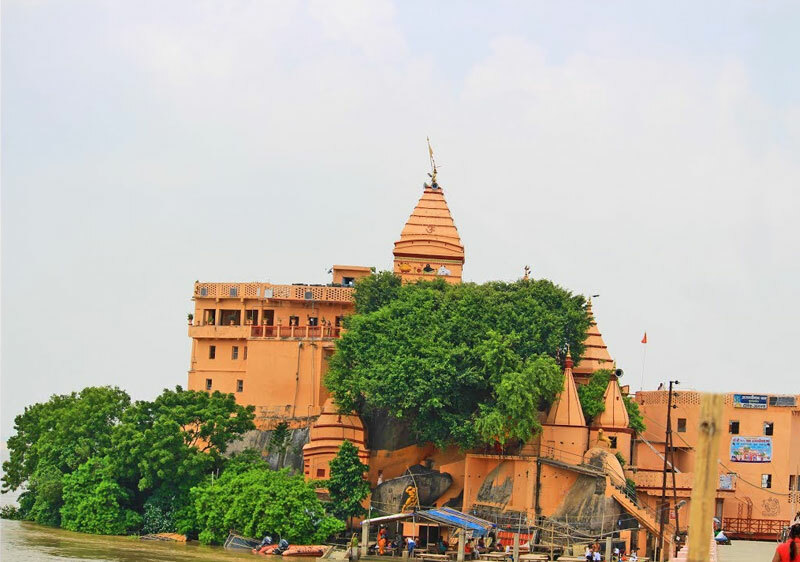 The Temple situated at Sultanganj in Bhagalpur District (Bihar), Ajgaivinath temple is dedicated to Lord Shiva. It is believed that the deity of the temple is Swayambhu. The temple is constructed on a rock and has a series of excellent rock sculptures and inscriptions. The sculpture dates back to the Pala period. The splashing waters of the Ganga sanctify the area. The temple is solidly built on the rock and has got a series of marvelous rock sculpture and some inscriptions. Some of the specimens of the rock panel sculpture at this temple can hold their own against any of the best known specimens anywhere in India. 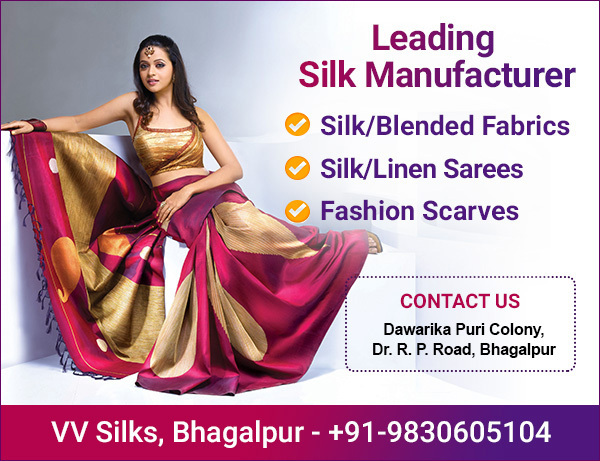 How to Reach: Sultanganj is well connected with train line directly from New Delhi, West Bengal, Assam, Mumbai, U.P, Patna as well as bus route from Muzzafarpur, Bhagalpur, Patna, Gaya, Ranchi. It is connected with National Highway 80 which connectes to all other major cities of India. However Taxis and Private Cars are easily available on rent in Sultanganj. Buses, unmetered Taxis, Scooters, Cycle Ricksaws are available for local transport. Get Route map. 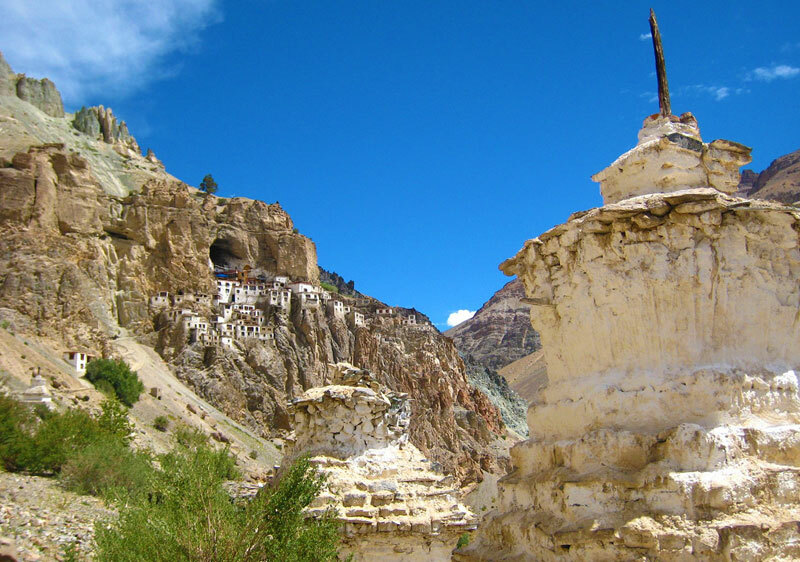 Hidden in the high altitudes of Himachal Pradesh, Spiti is one of the offbeat places you must visit once in a lifetime. Located at an altitude of 14,931 ft, it has a challenging personality. If you are seeking adventure, solace or to escape the cities, then Spiti is where you should be. The stark mountains have spots of green which are dotted with ancient monasteries. Trekking, camping, mountain biking and other adventures add to the thrill. Spend time in the villages of Ki, Kibber, Kaza, etc. Take a bike trip from Manali to Spiti for a memorable holiday. A miracle of nature, Nubra Valley in Ladakh is one of the true offbeat places in India. The valley in Ladakh is a unique site; it is a fusion of a desert, lush fields and a small town. 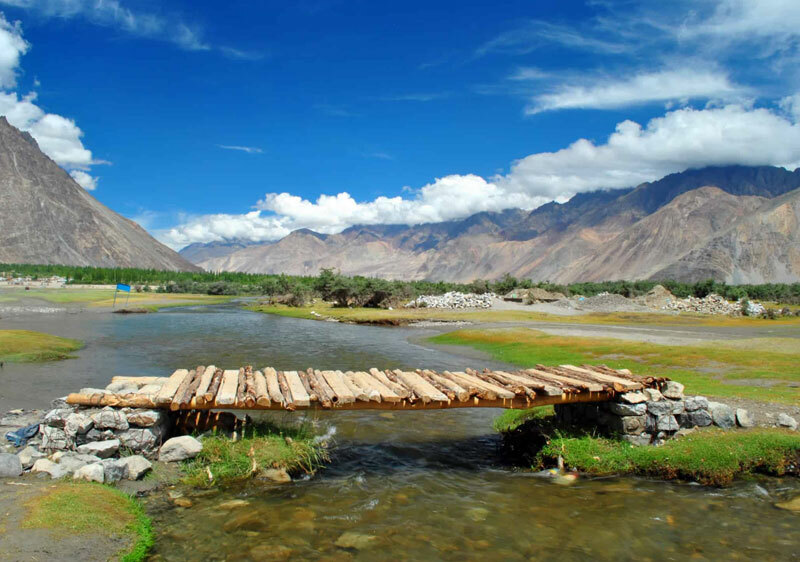 A visit to Nubra valley opens a multitude of opportunities. Explore the desert complete with sand dunes inhabited by double humped Bactrian camels. Enjoy the scenery of lush greenery fed by two rivers. Discover quaint villages at the foothills of ancient monasteries. An incredible experience, Nubra Valley is one of the most amazing locations in India and one you must visit. Chopta is a scenic hill station in Uttarakhand. As compared to the tourist crowded towns, Chopta is relatively unknown. Watch the snow-covered peaks in the backdrop. The green slopes and grassy meadows have a relaxed vibe. It is a perfect spot to take a break from the city life. Enjoy the lesser pleasures of life in the picturesque town. 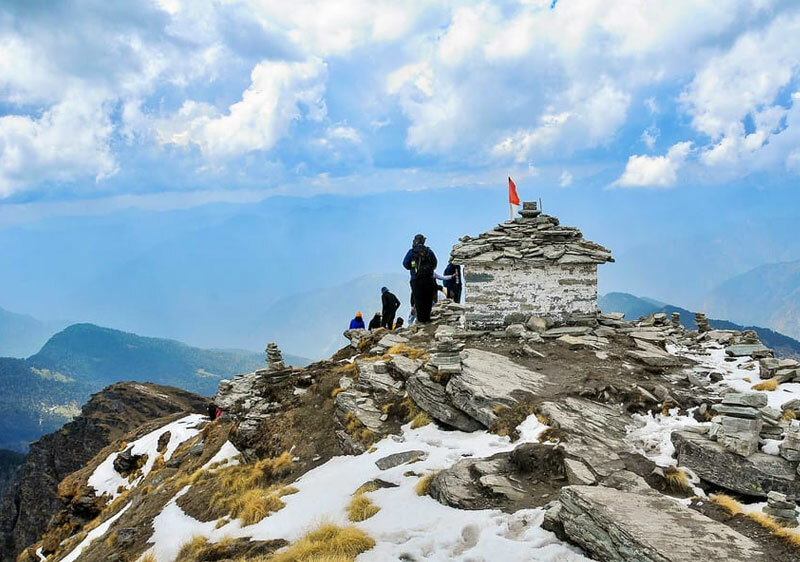 If you are keen on adventure then Chopta serves as a base to trek to Tungnath temple and the Kedarnath wildlife sanctuary. You can also trek to Chandrashila peak. 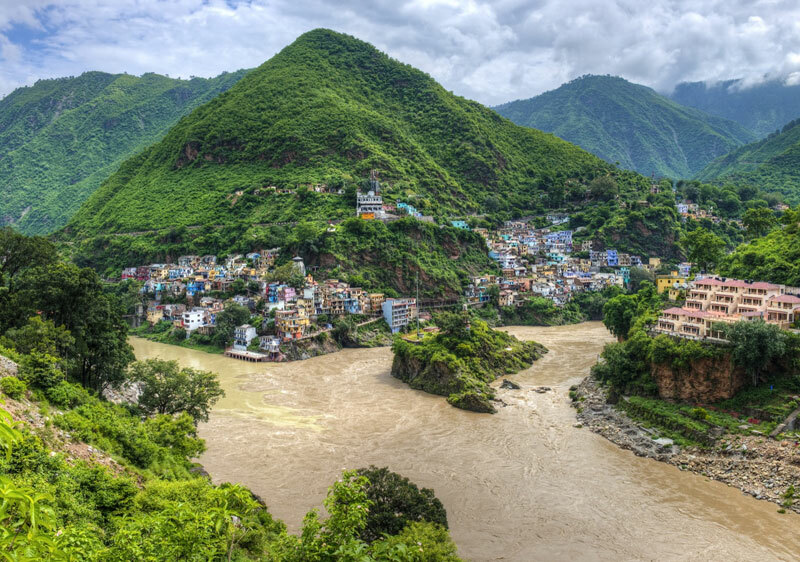 Enjoy natural bliss on your offbeat holiday in Uttarakhand.